thirty five games and losing just ten. He got beat out for the AL Cy Young Award during the strike-shortened 1994 season by future Yankee teammate, David Cone. A rotator cuff injury then wiped out his 1995 season. He had an ok 12-11 record in 1996 but then got the opportunity to win the sixth and final game of that year’s World Series against Atlanta in his final performance in pinstripes. I remember thinking the Yankees had gone crazy after that Fall Classic, when they let both Key and the Series MVP, closer John Wetteland, sign with other teams. Key signed a nice deal with the Orioles but he really wanted to stay in New York. Turns out that rotator cuff injury that sidelined him in ’95 was enough to convince the New York front office they couldn’t match Baltimore’s guarantee of a second year. 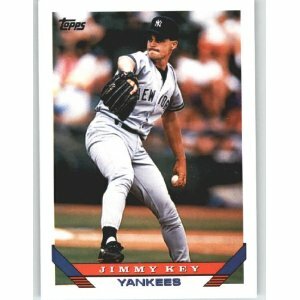 Key pitched well for the Birds in 1997, going 16-10 but when he fell off to 6-3 the following season he decided to call it quits, doing so with a 186-117 lifetime record. The retired southpaw made Big Apple back page headlines again during the 1999 preseason when the Yankees approached him about coming out of retirement to pitch in their bullpen. Key had made his big league debut as a closer for the Blue Jays back in 1984, saving ten games in his rookie season. The native of Hunstville, AL quickly threw cold water over the comeback rumors when he insisted he was done with baseball for good. Key shares his April 22nd birthday with this one-time New York Highlander shortstop.